My step-Dad has a beautiful picture book about Jesus’ life called He Was One of Us by artist Rien Poortvliet. I can stare at the faces for hours, paging through scenes of Mary, Nicodemus, Peter, the woman caught in adultery, and the crowds – all of them reacting to Jesus. You can read their hearts on their faces: surprise, hope, anger, fear, shame, curiosity, exuberance. And Jesus’ face, too, reveals his heart: joy, compassion, steadfastness, anger, anguish, love. I feel particularly happy when I spend time on the two-page spread of Jesus as a boy (pictured above). I am delighted by his openness and wonder, just like I am with my nephews and nieces, and with the baby whose mother has been bringing him to Immanuel Lifestyle class. In these pictures of Jesus, I see the full range of childhood emotions and activities: nursing, listening to Daddy’s stories, discovering a dog, learning to eat with his own hands, developing eye-hand coordination and a sense of satisfaction for a job well done. Here is Jesus presented to us as a real boy growing into a real man. Val’s comment reflects not only scripture but also the theology of the Church Fathers. Irenaeus of Lyons, likely only one person removed from the apostle John, wrote near the end of the second century, “Jesus … sanctified each stage of life by making possible a likeness to himself. He came to save all through his own person; all, that is, who through him are re-born to God; infants, children, boys, young men and old. Therefore, he passed through every stage of life. He was made an infant for infants, sanctifying infancy; a child among children, sanctifying childhood…. So also he was a grown man among the older men” (Adversus Haereses, II, xxii, 4). Two centuries later and across Europe from Irenaeus, Gregory of Nazianzus extended this train of thought. Gregory wrote, “What has not been assumed [taken on by Christ] has not been healed” (Epistle 101, 32). That is, everything Jesus has become – infant, child, and adult; mind, body, and emotions – is able to be healed through Him. As we approach Jesus in Immanuel Prayer and Immanuel Journaling, we use our imaginations along with our thoughts, our emotions along with our five senses. In so doing, we are not going beyond the scope of Jesus’ redemptive work. In fact, just the opposite: we are learning to experience our humanity and Jesus’ humanity in its fullness. We can learn not only to think like Jesus thinks but to feel as he feels. Based on Jesus’ words and deeds as recorded in the Bible, we can make good guesses about his emotions. The more time we spend imagining how Jesus felt when he healed the lame man or asked the woman at the well for water, the more our emotions come into alignment with his. We are moved to compassion by suffering, to anger by injustice, to joy by restoration. Thus we bear more fully the fruit of the Spirit (love, joy, peace, patience, gentleness, etc. ), which are not simply states of mind but states of heart. We can also come to imagine more accurately how Jesus might respond emotionally to us and our life situations. We can imagine his tenderness as we come to him in shame and fear, the sparkle in his eye as we tell him about our successes, his open posture and face as he invites us to work alongside him – even his gentle but firm correction when we’ve done something hurtful or selfish. Where some forms of spiritual and religious practice offer a state of tranquility or existence entirely devoid of emotional involvement and separated from the suffering of others, Jesus offers something more redemptive because it is intimately linked to real, human experience and a world that is undeniably in need of healing. Jesus offers a peace and personal connection right in the midst of the full range of human life and emotion. We don’t have to “get above it” but simply find him emotionally present and understanding in the messy middle of it. And we don’t have to respond to the broken world, either, by getting above it or away from it. Instead we can enter into the emotional, physical, intellectual chaos of life and help hurting humans find the fully human Jesus there. 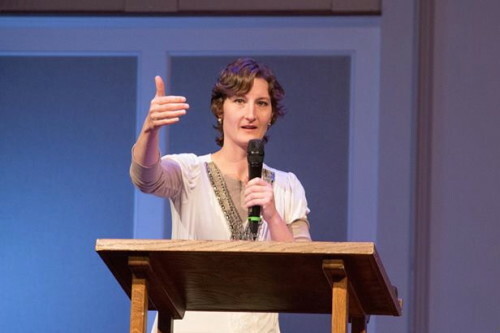 Jessica Handy trains people in Immanuel Prayer for the nonprofit organization Alive and Well, Inc. An educator and pastor, Jessie is passionate about unity and maturity in the church, intergenerational relationships, and real transformation. In two decades of teaching and ministry, Immanuel and the Life Model are the best way she’s found to make her passion a reality. Sign up to receive Alive and Well’s monthly Immanuel Prayer Updates for information about Immanuel-related events, trainings, and resources.